I love words. It is a love I have always had. Words are for play and for deep conversations. I have use for this love of mine both in my work as a priest in the Church of Sweden and as a professor in ecclesiology at Uppsala University. Sometimes though, I feel a need for refuge from words in bodily experiences. During the last years I have even attended a course in how to use the body and bodily movements in worship. We learn – and have to learn anew – how to say with our bodies what we say with words and to put words to what our bodies say to us. Images are important for me too. During one period of my life, I painted a lot. Images from inside of me wanted to come out. That was a major reason behind my theological studies and my wish to be a priest. Through the images, God managed to make contact with me, in a way that words had never been able to do. Communication is what holds all of what I do together. Communication with words, images, movements and actions and with God and fellow human beings. This webpage is for you who want to share some of that with me. • Download my resume and a book chapter, which explains the role that gender plays in my research. I am a priest in the Church of Sweden, a Lutheran church that gathers about two thirds of the Swedish population. At present, I have no permanent position as a priest, but I regularly have personal conversations with people, I baptize, I preside at weddings, I bury the dead and I lead Sunday liturgies. 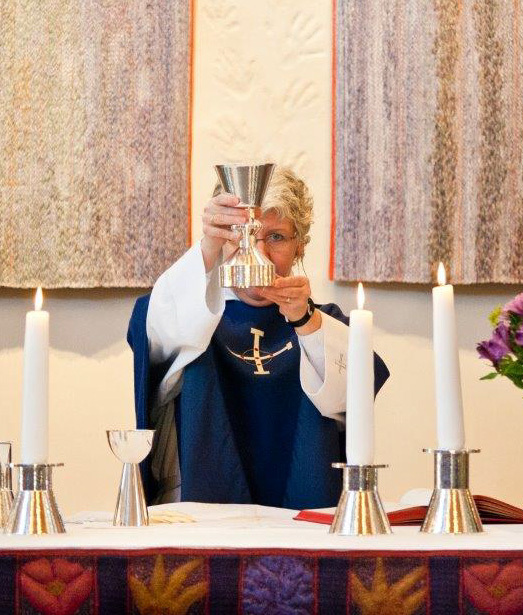 For several years, I led a type of worship in Salabackekyrkan in Uppsala, called Sinnesrogudstjänst. In English that would read Serenity prayer service. It is a type of liturgy, which in a special way provides space for the participants to be who they are, and where they are in life, even when that is no success in the eyes of the world. Many of the participants come with experiences of addiction. For many of these people meeting God is about life and death. Without God, life would not be possible. It would not for any one of us, but in certain situations in life that becomes clearer. The Serenity Prayer services combine my interest for the social involvement of the church (diakonia) with my interest for liturgy (leitourgia). I have written several articles about the relation between those two aspects of the church during recent years. For some years (2006-2012), I was involved as an expert in the renewal of the worship manual for the Church of Sweden, a renewal that will eventually result in a new worship book. One of my long-term engagements has been with Leitourgia – the Nordic Network for Liturgical Exchange, of which I was the chair in 2014. Most of my time I work as a teacher and researcher at the Uppsala Religion and Society Research Centre in the theological faculty of Uppsala University. My university page provides more information about that. I am part of a Centre of Excellence program, called The Impact of Religion. Challenges for Society, Law and Democracy. I am currently involved in a project within the program focusing on the values held by parents of small children. What does it mean that Swedes seem to value different things in life, compared to people in other parts of the world? Apart from doing research, I also do some teaching. I supervise both undergraduate students and PhD-students. Sometimes I also supervise students at other universities, both in Sweden and abroad. The courses I teach are in Swedish, even if much of the literature is in English. They are courses in Christian Social Practice (diakonivetenskap) and in Liturgy. Professor in ecclesiology at Uppsala University, where I teach and do research. Priest in the Church of Sweden. More information to be found here.